Only natural wood from the hills of Tuscany and Umbria. Nothing is factory produced. 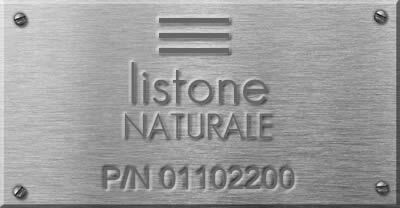 Each part of Listone Naturale is completely natural and traceable. Tuscan Oak , Tuscan Chestnut cover the local hills and are subject to strict environmental controls and lumbering restrictions. The difference between each hill, in terms of altitude, exposure to sunlight and soil content, lends each tree a specific identity. Antique wood from old local houses, castles, farms and warehouses is recouped and selected, to bring original history and authentic beauty back to life. Only small-scale, flexible, craft production can guarantee that these materials are handled and transformed in a fitting manner.